Last quarter of 2008 Alibaba, the largest B2B marketplace in the world made a shocking announcement: It would launch to market a new premium product; the “Starter Pack” priced around 60% below its current flagship service, the “Gold Supplier Membership”. A lot of things have been said that this is a tactical move from Alibaba’s management to respond to the economic slowdown and decline in Chinese exports, but in my opinion it’s much more than that… It’s a complete change in their business model. They are going from: a model based on a small amount of clients paying very large fees (Gold Suppliers paying around USD 7.000 per year and the rest is Free Subscribers) to another scenario where they will have a much broader base of customer paying a lower initial fee (around USD 3.000) and increasing the sales of Value Added Services (VAS). This a fundamental change not a response to the crisis. The objective of this article is to try to show Why Alibaba is making these changes? What business results has led Alibaba’s management to make such an important change of strategy in the middle of an exponential growth in revenues and net income? The short answer is, in my analysis: 1) a decline in Alibaba’s conversion rates and 2) Stagnation in Alibaba’s penetration rates of it’s core market. Gold Suppliers (GS) as % of total registered users in the International Marketplace has been stagnant at around 0,60% since 2005 and will probably drop to around 0,40%-0,50% in the year ended in 2008, according to my estimates. China Trust Pass Members (TP-Chi) as % of total registered users in the International marketplace has declined from 1,35% in 2005 to 1,15% in 2007. Gold supplier and Trust Pass conversion rates (new paying members divided by number of new registered users in the same period) have declined in the last 3 years. These and the other ratios shown are saying that Alibaba might have reached its ceiling in terms of conversion rates of premium services at actual prices. It would probably be much more costly and margins would decrease if Alibaba wanted to maintain or increase these rates. If they want additional revenue it’s clear it has to come from somewhere else. Another way to analyze the data is to try to find how many companies are paying the “Gold Supplier” subscription as a % of the total number of Chinese exporting companies. To find reliable data from Chinese companies is very difficult. Some of the sources are even contradictory, being in many cases official sources. 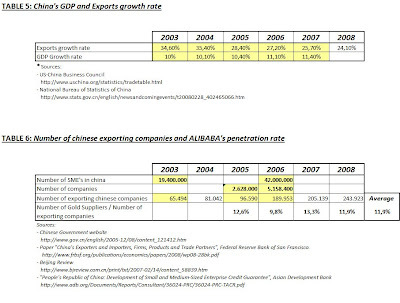 Nevertheless, I’ve tried to come up with an estimate (details shown in the Excel file at the end of this post) and the result is that in the last three years, Alibaba’s penetration rate has been stagnant around 12%; meaning that around 12% of exporting Chinese companies pay the Gold Supplier rate. A very impressive penetration rate in my opinion, but stagnant for the last 3 years. It’s not that Alibaba is just lowering prices as a response to the crisis; they are doing it because they’ve reached their own limits in terms of conversion rate and penetration rate in their target market. These findings, together with the fact that around 90% of the keywords available for sale at Alibaba (only paying subscribers are allowed to buy them) remain unsold, called for a change in strategy. Now it’s the right time to move on and monetize the next layer of its customer base. Online retailing Amazon vs. eBay Which is the best option for online vendors? 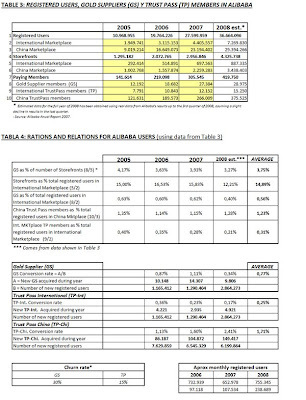 You can download these figures and other important data and ratios from Alibaba here, in my ALIBABA Excel Spreadsheet. I wish to warn as many people as possible of the risk of dealing with companies listed on Alibaba.com. Alibaba cannot be trusted, they list bogus companies who offer goods at very low prices, accept payment via TT and do not send the goods. Alibaba is no better than these companies as it makes money from their dishonest activities and lists many of them as Gold Suppliers implying that they are honest traders. Alibaba will not help people who have been robbed in the recovery of their money and will not take any responsibility for the loss. Please avoid Alibaba and the companies they list. I am speaking from experience; I lost a large sum of money dealing with a Gold Supplier who proved to be a fraud. One of the Best 100 blogs for MBA Students ! !